I have the opportunity to access the photo archives of my close friend Bernt Larsson and I’m glad to share many of these valuable pictures with you all. Some of these are quite old and fortunately I’ve been able to scan the negatives and touch them up for cleaning (speck of dust, scratching, etc.). I hope you will enjoy them. There will be more, and both Bernt and I are grateful to Vic Brumby for his initiative to start the Europlate blog. The first batch of negatives illustrate The Aden Colony (1937-63) and Aden Protectorate (1937-62) (or Federation of South Arabia as from 4/4/62) plus a photo from the Mutawakkilite Kingdom of Yemen from the 1950s. On 18/1/1963, the two Adens merged to form The Federation of South Yemen. Independence from Britain came on 30.7.1967, when the short-lived Federation of S.Y. was renamed the People’s Republic of South Yemen. 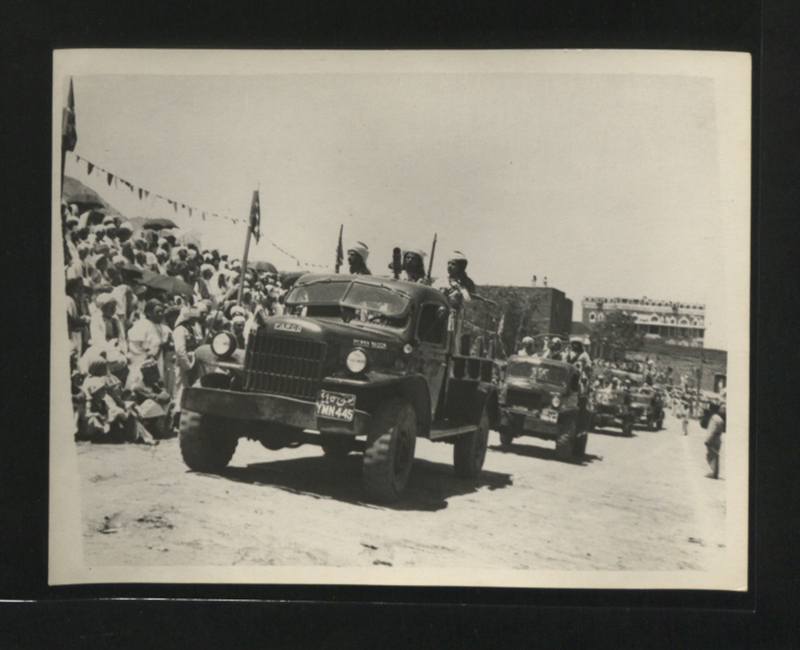 Fargo brand (US) army vehicles carrying machine guns manned by HM the Imam’s bodyguard. 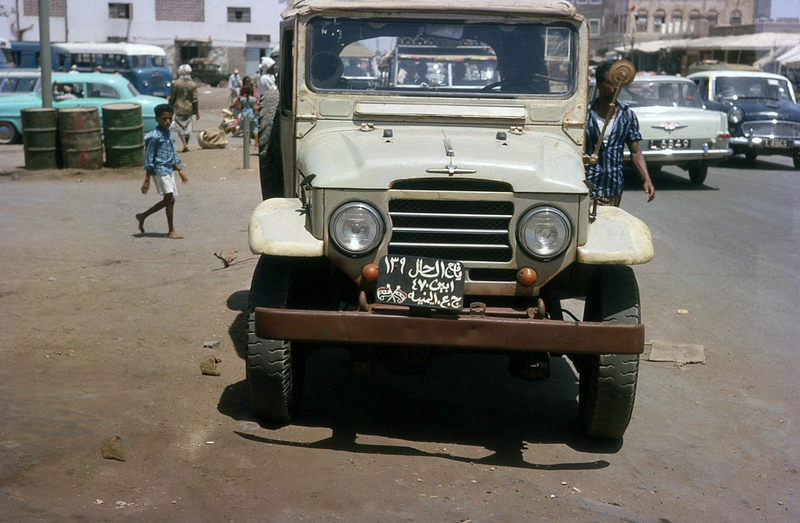 Now follow a series of South Yemení images taken by a friend of Bernt Larsson at the beginning of the sixties. 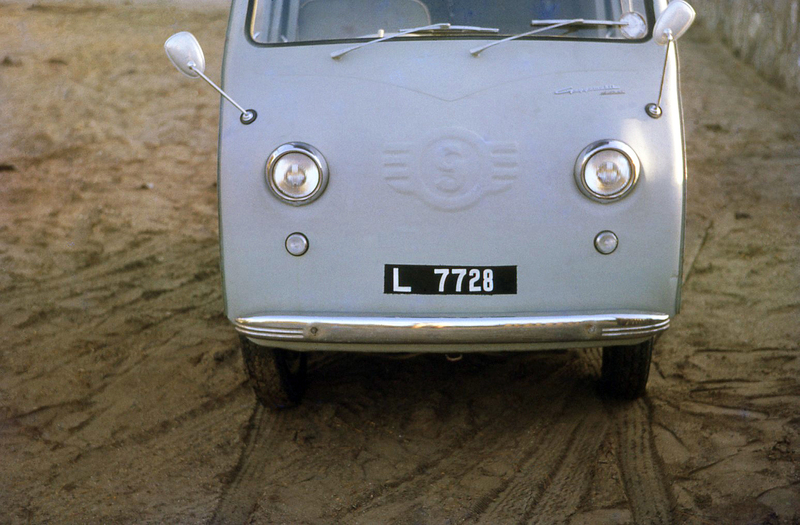 Some vehicles have two plates for the free transit between the different states of the Federation – presumably. The Land Rover on the left has ‘Lahej 138‘ . The right one carries two plates – ‘L 8356‘ (ADN) and ‘Mukayris 340 Abyan‘ and the third has ‘FG 64‘ for the Federal National Guard . 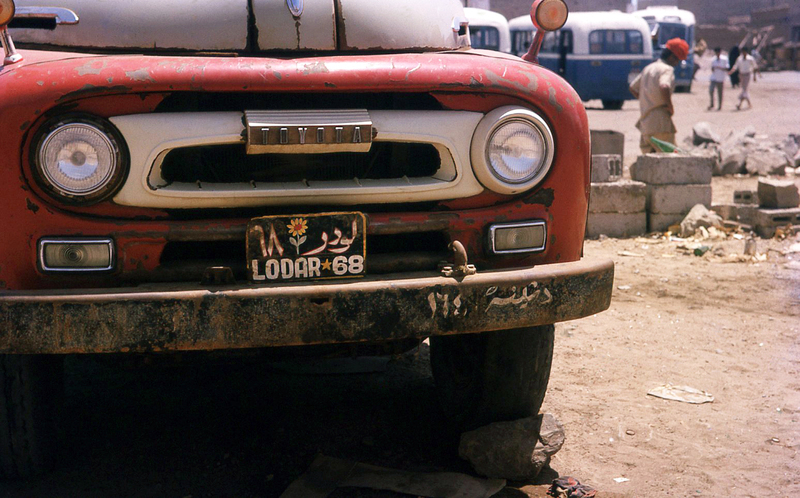 ‘Lodar 68‘ from Audhali Sultanate in the front and ‘Dathinah 164‘ painted on the bumper. 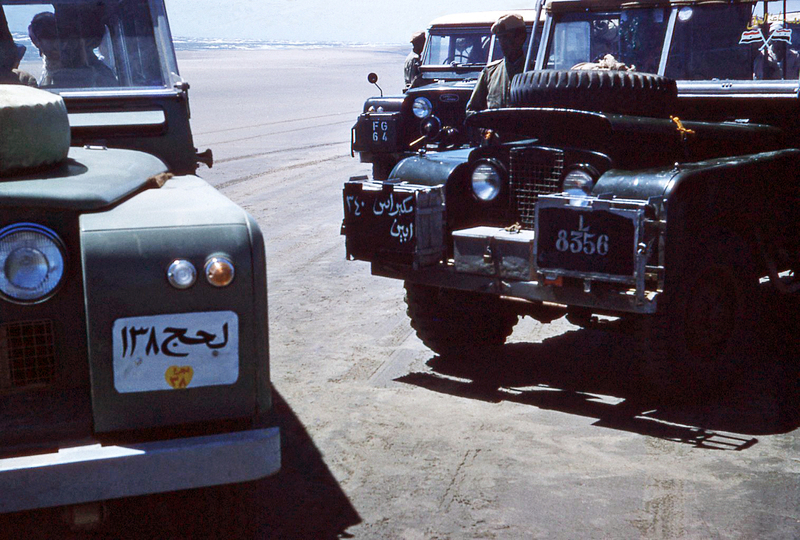 Two registration in one Land Rover plate: ‘Abyan 1122‘ and ‘Yafa Sahel 398‘. 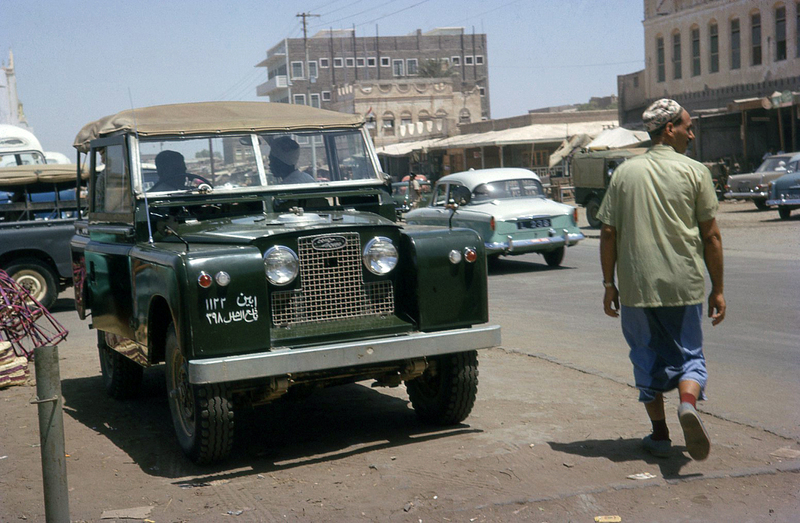 A Hillman Minx is driving by, L 234 from Aden Colony. Two registrations in one plate: ‘Yafa Sahel 139‘ and ‘Abyan 470‘. On the right one can distinguish an Opel Rekord with the plate ‘L 6849‘ from Aden Colony and a circa 1958 Standard Vanguard Ensign L 4355. Another double- registration. 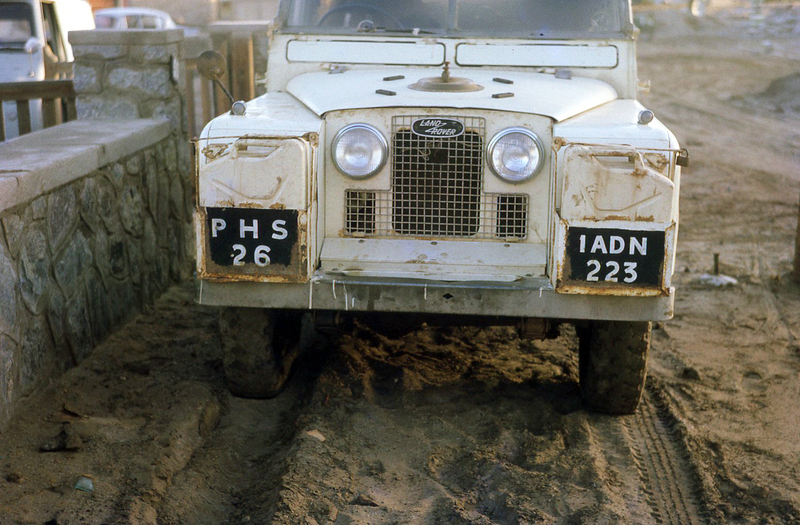 ‘PHS 26′ (unknown code) and ‘1 ADN 223‘ from the government (1) vehicle series. The Yemen Arab Republic, also known as North Yemen and as Yemen (San’aa) existed between 1962 and 1990 , when it united with PDRY (South Yemen) 22/5/90, forming Republic of Yemen.